Happy Thursday! Thursday is our favorite day to spread some happiness by sharing happy words from clients. We are grateful every single day for the array of clients we have and those we will have in the future. As we approach Thanksgiving week it is even easier for us to express our gratitude. We love hearing from past and present clients who have become part of our KD Kanopy family. Thank you for choosing us to help put your brand in front of others. Time to party, polo style. 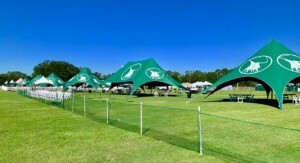 “We reached out to KD Kanopy with a vision of transforming our event with branded tents. Working with their team was such an easy process. The final product turned out absolutely amazing and we couldn’t be more thrilled with final product”. When was the last time you set out to host an event? Bringing people together, no matter the occasion is sometimes easier said than done, right? Take a quick pause & think about all the details that go into a good event. There’s food & drinks of course but think even deeper. There’s usually a bartender, seating for everyone, dinnerware, and the peace of mind that all of it comes together. And if you’re lucky, there might even be an opportunity for a hot-air balloon ride. More on that later. Event planning can be stressful but it doesn’t have to be. That’s where Black Stone Events comes in. They do events. And they do them well. Their one-of-a-kind, experienced, trained, and certified staff is ready to “exceed your expectations” whether you’re looking to have an intimate guest list of 150 or a larger gathering of say 7,000+. Either way, you’re in good hands with Black Stone. Black Stone puts on one of the best parties around for the Victory Cup Polo Match which has been dubbed ‘America’s Polo Match’ and is becoming more and more popular since they started 4 years ago. This event has grown to be ‘one of the largest equestrian events in the United States’. A big party like this calls for a big day of coordinating and thanks to Black Stone, thousands of people got to enjoy a beautiful day of horses, green grass, exciting polo, all kinds of food and drinks and to top it off, hot air balloons rides!